Loire Valley Castles - Self-guided bike tour : discover the most magnificent castles from Blois to Angers. Cycling tour level : 6 or 7 Rides (from 28 to 61 km) along the Cher and the Loire Valley on cycle tracks or peaceful roads. This bike tour includes : Hybrid bikes or electric bikes, accommodation in 3 or 4 star hotels or in 2 and 3 star hotels, luggage transfer, English phone or email assistance during your trip. The castles of the Loire Valley that can be visited during the cycling tour : Blois, Chambord, Amboise, Chenonceau, Langeais, Ussé, Azay le Rideau, Chinon, the abbey of Fontevraut, are all sumptuous sightseeings filled with history. This is the heart of the Loire Valley, renowned as UNESCO World Heritage Site. This gorgeous heritage is unique in the world. The banks of the Loire and Cher Rivers are the thread of this tour, as well as some unexpected and exquisite landscapes that unfold peacefully from ride to ride. This is a real dream to explore this region by bike! A very pleasant and special moment. Blois Arrival in Blois, check-in at your hotel and you will get your bikes. The Royal castle of Blois is worth seeing; the architecture is outstanding and played a major role in the History of the Loire Castles. It was the Royal House of 7 kings and 10 queens of France! This is also an evocative place of the Renaissance. François the 1st was one of the builders (as Chambord and Fontainebleau) and the Duke of Guise was murdered there under the command of Henri II in 1588. *If you arrive early you can go for a ride to the castle of Chambord and come back by the banks of the Loire, 37km or you can also stay one more night in Blois to get the time to visit the 2 places. Blois-Amboise, 43km / 27 miles When you follow the Loire Valley by bike (which doesn’t really follow the river), you will discover a country rich in History and Heritage: Candé sur Beuvron, Chaumont Castle, perched on a headland with a wonderful panorama over the Loire. The visit of the castle is worth seeing with its wonderful park. Arrival in Amboise and its castle by the Clos Lucé where Leonard Da Vinci spent the last 4 years of his life. Amboise – Tours, 28km/17 miles + Chenonceau castle, 25km/15 miles If you did not do it the day before, visit Amboise and the Clos Lucé .Continue you way towards Tours. Otherwise you can also make a detour to Chenonceau from Amboise by Chenonceau (shared route, not secured yet) and come back to Amboise by the same road (25km for the return trip) and continue to Tours (with good cycle paths). 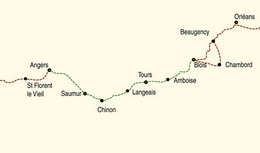 It’s also possible to leave from Chenonceau and take the TER to Tours (the station is next to the castle). Tours – Langeais, 31km/19miles + Azay Le Rideau 16km/10 miles One of the most beautiful stages along the Loire, along the banks of the Cher to the castle of Villandry and its wonderful gardens and water works. After that continue through the Levée (dike on the Loire) and cross the Loire to reach Langeais and its major medieval castle built by Louis XI. The route to Azay Le Rideau is also an option before reaching Leangeais, near the chapel of Naux, across meadows and orchards, by small roads. Azay Le Rideau is a castle built on an island in the middle of the Indre, a beauty of the French Renaissance, built during the reign of François Ist. 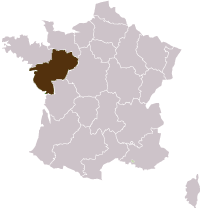 Langeais – Chinon, 38km/23 miles. You leave Langeais and its fortress by the suspended bridge and following the Loire. Cycle towards Bréhémont by the Levée (the same from Villandry). It offers a wonderful panorama over the Loire and the traditional boats; you will feel the authentic and harmonious atmosphere. Take the time to visit the castle of Ussé, the one from the Sleeping Beauty that inspired Charles Perrault (3,5km return trip). Then choose one of the 2 itineraries to get to Chinon. Chinon – Saumur, 35km + 12km, to the abbey of Fontevraud Between Touraine and Anjou, a beautiful stage that starts by the shores of the Vienne River, to Savigny en Véron. The itinerary reaches the village of Candes St Martin. In Montsoreau make a short detour to the abbey of Fontevraud, one of the most beautiful heritages of the Loire Valley, with its polychrome recumbent statue; On the way back to Montsoreau, there is another castle, immortalized by Alexandre Dumas. Only 18km up to Saumur but with a few steep ascents (one of 18% in Parnay). Enjoy cycling in the heart of the Saumur Champigny vineyard. This tour can also be done in 6 nights or 8 nights with rest days. - Personal insurance : repatriation and cancellation insurances : we highly recommend to subscribe your own insurances. We advise : this tour can also be done in 6 nights and in the opposite way.